One Lost Sheep...: New button! So it seems that my “Find My Family Friday” posts are attracting quite a bit of attention; I’ve even had people find my blog by Googleing “Find My Family Friday”! 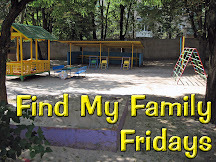 For that reason, I wanted to make it easier for people to find all my “Find My Family Friday” posts all on one page and easier for others to link back to my posts on their own blogs. So… I made a button! You know I soooo want to put that on my blog. Soon!